The patented IVEK Liquid Eye provides detection of liquid or air inside translucent tubing for critical dispensing applications. This accessory consists of a detector and a controller. 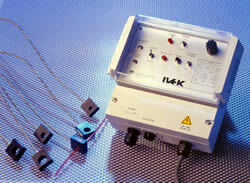 The detector is not in the fluid path and works with most translucent tubing types. Standard sizes for the detectors range from 3.2 mm (0.125") up to 15.0 mm (0.590"), with custom sizes also available. The Liquid Eye operates on a principle of high frequency, multipath reflection, and it is insensitive to background light intensity. The detection circuitry has front panel gain and intensity adjustments for tailoring the sensitivity to accommodate a wide range of fluids including clear, tinted or turbid solutions and some slurries. The output is a contact closure signal that has a terminal block for connection.